A Sanskrit word meaning circle, ‘Mandala’ essentially refers to a circle with a centre point from which a symmetrical design radiates. Found in so many natural forms like flowers, snowflakes, starfish, spider webs, etc., the mandala has been used in many cultures as a spiritual or ritualistic symbol representing the universe. In recent years, however, because of its popularity, the word mandala has become a general term for any circular design and is a popular subject in many crafts, not least embroidery. 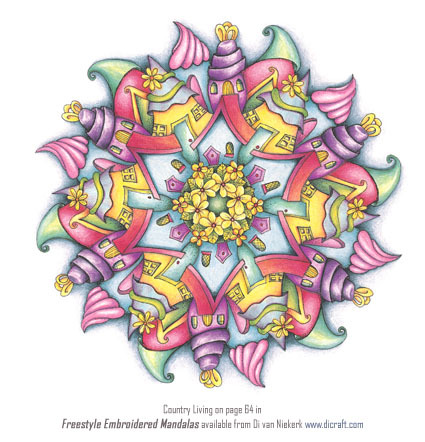 Freestyle Embroidered Mandalas is a collaboration and co-creation by three well-known authors who worked on a beautiful Mandala book along with a team of talented South African embroiderers. This is the front and back cover of the book. Here are only some of the designs and projects in the book. Don’t you think they are lovely! There are a total of 25 designs and 27 projects (as two designs were repeated in different colours to show you how versatile the patterns are) so there is something for everyone. For more information about the book and to order, click here and click on the online store of your choice. Some templates have been given two completely different embroidery treatments to illustrate how versatile the designs are. Both line and colour templates of the 25 designs are included, with a detailed stitch diagram and list of threads and materials for every project. There are many more gorgeous designs in the book. Not to be missed!